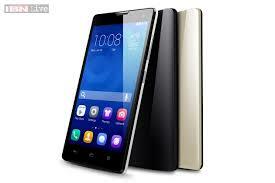 When it comes to the smartphone itself it has a 5.5-inch 1080p touchscreen, dual 8 MP main cameras, an 8 MP secondary. Inside there is a HiSilicon Kirin 925 chipset, which comes with an octa-core CPU that has four Cortex-A15 cores and four Cortex-A7 ones. The phone has 3GB of RAM, 16GB of storage, and microSD card support. It runs Android 4.4.2 KitKat underneath Huawei’s Emotion UI 3.0.